In the world of literature, these are boom times for dystopian fiction and refugee sagas. 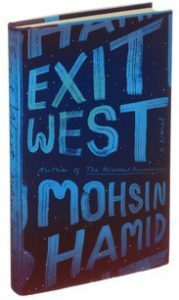 A recent stand-out in the latter category is “Exit West,” by Mohsin Hamid. The short novel starts with a set-up familiar to anyone who reads the newspaper. Violence in an unnamed Middle Eastern country drives the protagonists, Nadia and Saeed, from their home, leaving behind family and the familiar world. The tale veers into the realm of magical realism as they escape to Greece, London and California through a series of doors that open and close unpredictably. But at heart the story is about the complex relationship between Nadia and Saeed, and the difference in their ability to cope with the relentless change that defines a refugee’s passage. For anyone working with refugees, “Exit West” offers a view of the hope and dismay that accompanies escape from the world’s many war-torn countries.